Back in 1935 a gentleman by the name of H.W. Carr wrote a letter to W.C. White (Ellen White’s son.) Mr. Carr wrote that some Seventh-day Adventist leaders were saying that the Holy Spirit is a third person of the same nature of the Father and Son. H.W. 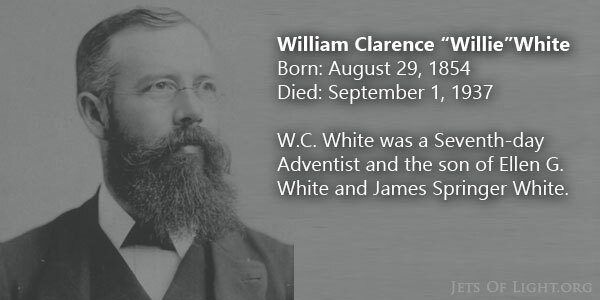 Carr wanted to know if W.C. White had any information regarding Ellen White’s position in reference to the personality of the Holy Spirit. These letters are interesting to me for three reasons. Mr. Carr used the words “It is urged by some of our leaders now…” It shows me that back in 1935 a new push by some of the Seventh-day Adventist leaders was taking place that promoted this idea regarding the Holy Spirit. Mr. Carr noticed the change taking place and he sent this letter to W.C. White to help him gain more information on the subject matter. William Clarence White’s response to H.W. Carr’s letter reveals to me that he personally did not agree with Seventh-day Adventist ministers trying to prove that the Holy Spirit was an individual as are God, the Father and Christ, the eternal Son. Mr. White nor Mr. Carr would not be able to be a member of the Seventh-day Adventist Church today as they would now have to accept the doctrine of the Trinity that came into our church officially in 1980. We have come along way since 1935. Back then it was a new teaching regarding the Holy Spirit. Now it is an established fundamental belief of the Seventh-day Adventist church. Here are the two letters for your reference. Your recent reminder of the efficient provision for carrying forward Sr. Whites work, and the gems of thought which accompanied your announcement is very much appreciated, “She being dead yet speaketh”. God has lead this people on, and is still leading, through his chosen servant, for which we praise Him. In the first pages of Great Controversy it is stated that the “Father had an associate – a co worker… The only being that could enter into all the councils and purposes of God. “The Father wrought by His Son in the creation of all heavenly beings… “He holds supremacy over them all. “Sin originated with Satan, who next to Christ had been most honoured of God, and was highest in power and Glory among the inhabitants of heaven. “Next to Christ he was first among the hosts of God. The Son of God had wrought the Father’s will in the creation of all the hosts of heaven. “The Son of God was exalted above Satan as one in power and authority with the Father. Christ created Satan. Ezekiel 28:15. It is urged by some of our leaders now that The Holy Spirit is a third person of the same nature of the Father and Son, a member of the heavenly trio, cooperative in creation and personally active with the Father and son. For many years I have used these statements Of (sic) Sr. White in combating false teachings relative to defining the Holy Spirit. Will you kindly tell me what you understand was your mother’s position in reference (sic) to the personality of the Holy Spirit. Does Sister White’s writings any where teach that prayer should only be addressed to the Father, or that we should not address Christ in prayer, only through the Father? I know Brother White you would not depart from your mother’s teachings, and that you have as perfect an understanding of them as any one. I shall appreciate your opinion very much. I hold in my hand your letter of January 24. For some months I have been so heavily pressed with work connected with manuscripts which we were preparing for the printer that my correspondence has had to wait. In your letter you request me to tell you what I understand to be my mother’s position in reference to the personality of the Holy Spirit. This I cannot do because I never clearly understood her teachings on the matter. There always was in my mind some perplexity regarding the meaning of her utterances which to my superficial manner of thinking seemed to be somewhat confused. I have often regretted that I did not possess that keenness of mind that could solve this and similar perplexities, and then remembering what Sister White wrote in “Acts of the Apostles,” pages 51 and 52, “regarding such mysteries which are too deep for human understanding, silence is golden,” I have thought best to refrain from discussion and have endeavoured to direct my mind to matters easy to be understood. There are many Scriptures which speak of the Father and the Son and the absence of Scripture making similar reference to the united work of the Father and the Holy Spirit or of Christ and the Holy Spirit, has led me to believe that the Spirit without individuality was the representative of the Father and the Son throughout the universe, and it was through the Holy Spirit that they dwell in our hearts and make us one with the Father and with the Son. My answer to your second question “Does Sister White’s writings anywhere teach that prayer should only be addressed to the Father, or that we should not address Christ in prayer, only through the Father,” is that I think not. I have not found such teachings in Ellen White’s writings. Your third question “Does she anywhere tell what the power is that “shall plant the tabernacle of His palace between the seas in the glorious holy mountain?” I must answer in the same way, I think not. We have not found any statement regarding this in Sister White’s writings nor do we remember any statement made orally in our presence. Enclosed with this brief and unsatisfactory letter, you will find our News Letter of April 4. I pray that you may have help from heaven in studying that which is necessary to be known and patience to wait for the revelation of that regarding which we are now in some uncertainty.